My name's Huw, a friendly and reliable guitar tutor. I have been a guitarist for over 12 years and have gained plenty of live performance, studio and teaching experience over this time. 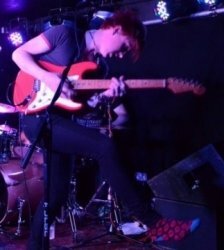 Having recently graduated from The British and Irish Instiute of Modern Music (BIMM) with a degree in Professional Musicianship I have developed a diverse range of skills and abilities in both guitar and teaching. Click this link to get a taste of some of the many styles I am competent in playing and teaching! I have recently been working as volunteer teaching assistant with Access to Music Brighton. At Access To Music I have been assisting two tutors in running level 3 rehearsal sessions with 33 students in the cohort. I have been applying my knowledge of music theory in contemporary Pop and Rock music styles. To begin with, I was assigned one particular band, helping them prepare for a performance. I helped theses students achieve very successful outcomes with their music practice. Since working with Access to Music for the past 6 months, I have developed a great rapport with students and tutors alike. Currently I work as a Band Leader with Rocksteady Music School. I help primary school kids discover what it takes to work together as a band whilst simultaneously teaching them the basics of a few different instruments. Additionally, I have taught on a one to one basis over my time as a guitarist. These have predominantly been in a volunteer context and, as such, I have gained valuable experience in assessing an individuals desires and needs when it comes to learning guitar. I am offering a home visit service for guitarists of all ages. I am able to teach a range of styles tailored to each student. Whether you want to learn your favourite songs, work on some technical exercises to improve your soloing and anything in between! I'm not about having a set structure to each and every lesson (although I can provide this if you'd like!). I'm more about ensuring that you are getting what you want to learn out of guitar lessons. HuwFrom Malcolm (5/5): I found Huw to be very professional, friendly, with a calm and patient attitude. and has processed my tutoring in this direction.